The art of persuasion entails a number of things, not just the ability to speak fluently and courageously in front of people. Just like a professional motivational speaker, you will need to learn how to engage the minds of those you are speaking to. This audiobook equips you with great techniques that will help you connect with your audience emotionally. You can engage with them by touching buttons that will convince them to follow your ideas. Therefore, you will need to understand your audience's motivations, behaviors, beliefs, and their attitudes towards various subjects. 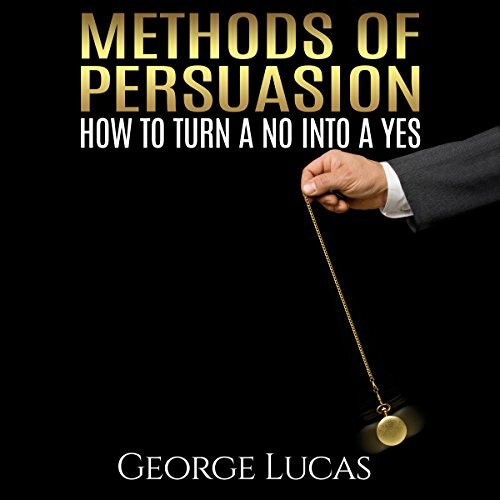 As you listen to Methods of Persuasion: How to Turn a No into a Yes, you will be amazed at how easy it can be to change other people's attitudes, beliefs, or behaviors and how easy it is to make them act on your ideas. Balanced, calculated spoken words have the power to impart reasoning and feelings. In this audiobook, we have outlined various techniques that will help you sway people towards your direction of thinking. The powerful techniques in this audiobook can be applied in different situations, such as in business environments, where you need to strike deals, and in relationships, when you want to create powerful, deep feelings of attraction within another person in order to initiate romance. Listening to this audiobook will help you understand how you can present yourself physically, emotionally, and tactically in order to appeal to the reasoning and expectations of your listener. By doing so, you will easily convince them to follow your ideas. What made the experience of listening to Methods of Persuasion the most enjoyable? I always read/listen to books like this one several times. I sometimes couldn't follow but that might be just me. What insight do you think you’ll apply from Methods of Persuasion? I definitely received some new information to complete what I've already known. You can only implement knowledge if you listen to several books which remind you of it, then you have to try it in real life.